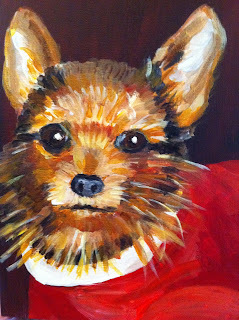 I've been thinking in the back of my head for awhile about trying out Etsy for my art-mainly for my pet portraits. I woke up this morning with a strong feeling to go ahead and go for this and try it out for a few months. So..always one to try and listen to my gut, I created a "shop" on Etsy just a little while ago. I've never really advertised my pet portraits before, except for posts on Facebook, so we will see how this works out with a much broader audience. I know that I personally like searching for specialty items on Etsy and its very appealing to me that everything is hand-made. Its hard to find anything original these days with everything so mass-produced. I try really hard when I am buying a gift for a friend or family member, to purchase something hand-made, or at least sold in a locally owned shop, or something that benefits a charity. As of right now, Im basically just offering 8" x 10" dog or cat paintings done in acrylic on canvas. Orders will take about 2-3 weeks. All a person has to do is email me a clear photograph. The price is the same that I offered at Christmas, $100 for the 8" x 10". Shipping is $12 for anywhere in the US, and $16 for anywhere OUTSIDE the US. Was not familiar with Etsy until I read your blog. Like the pet portrait idea.